Come July, TV screens in several households in the metros will either go blank, or people will find their energy metres ticking fast. As per a notification issued by the Telecom Regulatory Authority of India (TRAI) on April 30, cable TV networks in Delhi, Mumbai, Chennai and Kolkata will have to be digitised by June 30 under the first phase of the digitisation programme. The programme will be applicable across the country by 2014. While cable operators are struggling to secure sufficient number of set-top boxes—a unit that has to be attached to the TV set to convert the digitised signal to analogue form—to meet the deadline, analysts question the government’s hurry in pushing for digitisation even before there is an energy standard for the power-guzzling device. Though a small unit, set-top box consumes as much electricity as a refrigerator. 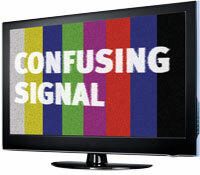 Companies advise in their user’s manuals that the unit should never be turned off from the main power so that important software updates from the control room of multi-system operators (MSOs are companies that own cable networks) can be sent to consumers. 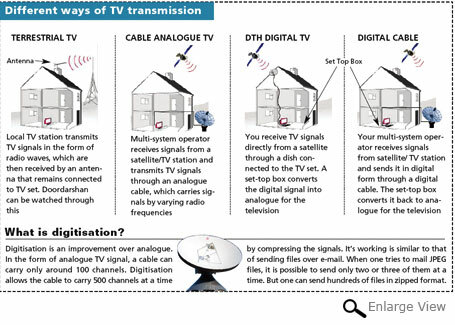 Hathway Digital Cable TV, for example, mentions this in its user’s guide. This makes the unit energy-guzzler. “If set-top boxes are switched off using remote control and not from the main power, they remain in standby mode and consume almost the same amount of power as they do while in use,” explains an electronic engineer who works as consultant with the government. Tata Sky mentions in its user’s guide that its set-top box consumes 18 Watt (W) when in use and 17W in standby mode. A typical set-top box that most MSOs import from China consumes around 20W when in use and around 18-19W when put into standby. “Some cheap set-top boxes consume 30-50W,” says the electronic engineer. At the rate of Rs 4 per unit of electricity and considering that a set-top box consumes 30W, a consumer will end up shelling out an additional Rs 870 per year in terms of electricity bill, he adds. High-definition set-top boxes and set-top boxes with add-ons like video recorder consume even more power, pushing the electricity bill further up. By the reckoning of cable operators, around 10 million set-top boxes have to be installed across the metros for cable TV digitisation. By 2014, around 250 million set-top boxes would be installed across the country. Now do the maths. A study by the US Natural Resource Defence Council (NRDC) study published last year found that some 160 million set-top boxes in the US consumed 27 billion kilowatt-hours of electricity in 2010, which is equivalent to the annual output of nine average (500 MW) coal-fired power plants. The report says set-top boxes alone were responsible for the generation of 16 million tonnes of carbon dioxide in 2010. Following the study, the US government has set Energy Star standards for set-top box manufacturers. India’s Bureau of Energy Efficiency (BEE) is also in the process of designing energy standards for set-top boxes used in the country. S P Garnaik, energy economist at BEE, says the technical committee has already developed the standards, which are now with the Union Ministry of Power for approval. While the June 30 deadline is round the corner, it may take several months before the ministry approves energy standards. So what happens to the boxes that are being installed now? Garnaik says standards of the set-top boxes that are being installed now cannot be upgraded later. This means the 10 million boxes will continue to be a power burden even after the energy standards are in force. Naresh Chahal, spokesperson of the Indian Broadcasting Foundation, says, “Both consumers and broadcasters will benefit from digitisation. It will increase the bandwidth of cable and more channels can be carried. Consumers will have more choice when it comes to content.” Analogue cable network has limited capacity (see infograph). But seven to eight direct-to-home (DTH) operators are already providing digital TV service in the country. Those who want to view more channels can subscribe to these DTH services. Why is the government making digitisation compulsory? A distributor for a private music channel, who prefers not to be named, says the aim of digitisation is to iron out the Rs 25,700 crore TV industry’s creases. For instance, local cable operators and MSOs pay subscription revenue to broadcasters of pay channels based on the number of subscribers but they often under-declare this number and pay less. Digitisation will help keep track of subscribers and organise the cable sector. Besides, digitisation will bring down the carriage fee that broadcasters pay to an MSO for carrying its channel at a particular frequency. As the carriage capacity of cable will increase with digitisation, the fee will go down. Roop Sharma, president of Cable Operators Federation of India, says the government’s move to digitise the cable network, following the lead of rich countries like the US and Germany, is to please foreign broadcasters like Star Plus and ESPN. “Consumers never demanded digitisation. It is imposed on them,” she adds. Sharma’s argument is evident from the fact that the cable TV network has been growing at nearly 40 per cent a year for the past 17 years. From 410,000 in 1992, its subscriber base grew to over 91 million by 2009, by the reckoning of TRAI. In fact in 2007, when the government had made a similar attempt to distribute digital TV signals through the Conditional Access System (CAS) in certain parts of the four metros, it did not pick up. There was no demand from consumers despite some cable operators offering digital cable service for free. Now with the compulsory digitisation, consumers will have to pay more for the cable connection. Currently, most consumers pay Rs 50-100 a month. After digitisation, they will only get Free to Air channels, like Doordarshan, for Rs 100. “No one watches most of these free channels. The popular channels are all pay channels, for which people will have to shell out at least Rs 150,” says G S Oberoi, legal counsel for Satellite Channels, an MSO in Delhi. Sharma says customers pay for the set-top box—which costs between Rs 700 and Rs 1,000—but it does not belong to them. They will have to return it when they withdraw their subscription. Had they owned the set-top box, they would have the choice to switch to a network of their choice, she adds. Bakshi says importing set-top boxes is worrisome at a time when rupee has dropped to almost 56 against the dollar. “It is difficult to obtain big bank loans so quickly,” says Oberoi. His company requiress 60,000 set-top boxes for its network. By May-end it was able to place orders for only 25,000 units. In May a parliamentary standing committee had recommended the government to encourage indigenous production of set-top boxes to meet the shortfall. To make indigenous production price competitive, it had suggested enhancing the import duty from 5 per cent to 10 per cent. Oberoi says despite the recommendations, the government is not taking any action.